Tagged values are used extensively since they allow us to customise the information we store for our elements. So unlike pre-defined fields we can add them as we require to match the needs of our project. Also within EA we can specify the type and, for some types valid values. So that’s all great. Within EA, tagged values can be accessed in several ways. For example, they are available as a tab of the element properties editor or can be accessed via a separate tagged values window. However, this does mean that the user needs to remember to switch to the relevant place to enter values. And although there is often the option to set a default value, there is no check that a value has been entered by the user, and hence it may be that the value is a true reflection of the authors input. We believe this leaves some room for errors and/or incomplete information when editing elements. So in eaForms we have provided some features which we believe can help users when creating and editing elements. Although simple these features not only hide some of the fiddly stuff associated with using tagged values, but also help improve the quality of the model. On the left we have used several check boxes to capture choices. On the right is a rich text box used to allow them to provide more detailed information. And on the top right we have a drop down where the user must select a value, no default value has been set and in the definition of the form we have flagged the field as mandatory. 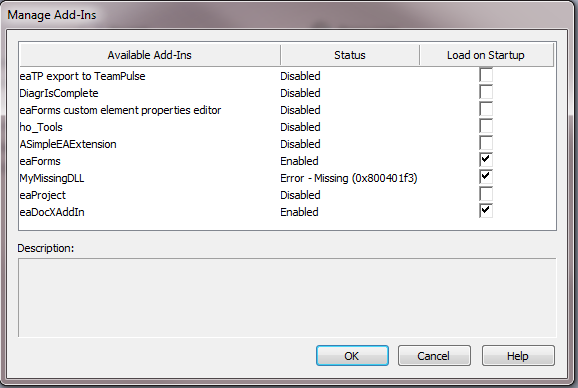 If the user fails to enter a value they are reminded that it is required before they can save their edit. And we must remember that our aim, as always, is to simplify the work of the user who has the knowledge that we need in our model. So in removing the need to switch to a different place to enter information, by consolidating it all onto a single form in a consistent manner, we can help the user focus on the task in hand. Just one small aid to helping getting the job done – I hope you agree. This entry was posted in Administrator, Manager on 02/02/2015 by exploringea. Prompted by 2 queries in a week about missing Add-in DLL’s I thought a quick post of the subject may be useful. One of the problems that I have seen many times during the development and use of EA extensions is the missing Add-In DLL. If you look at the Manage EA Add-Ins window in EA you may see an entry, as listed in the screenshot below, in the status column indicating that something is missing. There is a error code 8000401f3 which indicates that the application failed to create an instance of a COM object using a Class which is not registered on the machine. Hence EA is unable to load the AddIn. Having seen this issue numerous times I developed my EA Installation Inspector. This program emulates the process that EA may perform in loading your Add-in (Caveat – I don’t have insight to how EA code or how it does stuff in detail works so it’s my guess but seems to work so far). This program provides more information about the status of the AddIn as illustrated in the screenshot below. In this screenshot the purple line indicates that the DLL has not been registered, and hence is unknown to windows. Read the documentation supplied with the AddIn for more information. This list of keys matches the list of AddIns shown in the manage Add-Ins window. To be able to load your class EA will make calls to Windows, hence windows needs to know about your class as well, and your DLL (Class) must be registered with windows in a specific manner. The registration of your class may be performed in different ways. Typically it can be done manually using Regasm or performed as part of your installation by your installer. The registration process should create keys in relevant places in the registry so that when a request is made to load your class the appropriate DLL can be found. There are different versions of RegAsm depending on which .NET framework is being used. I suspect, but not tested, that you should use the Regasm supplied with the framework you are using. The problem as I see it is that with the co-existence of 32-bit and 64-bit programs the location of this information is crucial. Now I’m not a windows expert but I know that by working through the trail from the EA AddIn key,a slow process, a class can be registered with keys in the wrong place. So this is where EA Installation Inspector helps. It follows the trail through the registry from the EA AddIn key to finding the DLL file that contains the class that will be loaded. Typically when EA can’t find a file then keys have not been registered correctly. EA Installation Inspector will hopefully indicate the error condition and provide an indication of what is wrong e.g. DLL file missing, keys in wrong location. To check I will usually then manually register the DLL and rerun the installation inspector to check if the situation has improved. So far this has usually worked and leads me to check out what settings are missing or incorrectly set either in the IDE I am using or in the installer definition. Here are some checks that you can make which may help resolve your missing DLL within an IDE. Ensure that the DLL you are building is compatible with working with a 32-bit application. I always build my DLL’ 32-bit. For installers it is usually the case of accurately checking the definitions – usually against a know good installer. This entry was posted in Administrator, Automation on 19/01/2015 by exploringea. I think we have all been there either through our own doing ( as in my case) or because our boss/client has changed their mind or expanded their requirements. As its only me and its summer here, until I put the product out user testing I’m the only one to be concerned. However I’m hopeful that “just” a few more weeks of tweaking, testing and ensuring that the documentation is consistent and it will appear; I’ll keep you posted. On a completely different topic, I was asked by a friend a few days ago for some thoughts on setting up a multi-user EA project so put together a short document (Setting up a multiuser EA project Draft V1). At present it’s a working draft but I expect to enhance not least when I get more questions that come back – in fact, just thought the points I made earlier about agreeing requirements/change processes should be included! I’ll leave that with you – always happy to receive constructive feedback. This entry was posted in Administrator, All on 29/07/2013 by exploringea.